A digital meat thermometer can make your grilling life a lot easier, taking the guesswork out of cooking meat. It allows you to continuously monitor your roast's internal temperature and can even be programmed to alert you when it is done! A meat thermometer is a long needle that can be inserted into large pieces of meat, generally at the thickest part, to read the internal temperature of the meat. This is important because the final "doneness" of your grilled roast is determined by this internal temperature. While there are several ways to estimate doneness based on the appearance and feel of your meat, you need experience and even then can sometimes get it wrong, particularly for large pieces of meat that take a long time to cook, such as beef roasts, leg of lamb, whole turkey and whole chicken. The thermometer takes you right inside the meat, letting you know what is going on at its depths where you can't see. A digital meat thermometer is simply a digital version, rather than the standard meat thermometers which work just like a regular old traditional thermometer. However, because they are digital, they often have many more useful features than a standard thermometer. 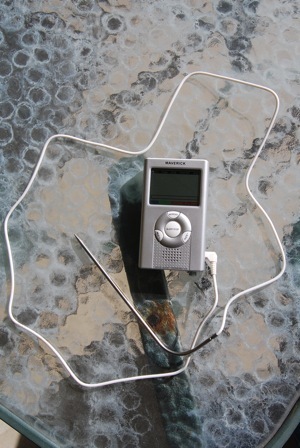 For example, most digital meat thermometers, like the one pictured above, have a probe needle with a long heat-proof wire. This allows you to place the needle into your roast before you start cooking and leave it there throughout the cooking process. The heat-proof wire simply hangs out your grill (even if you close the lid on it) or oven and attaches to the thermometer unit. This has several advantages. For one, you don't have to keep poking your meat several times. Each time you poke your meat and then withdraw the needle with a regular thermometer (or fork) you let precious juices from inside the meat run out! Leaving the needle in the meat avoids this problem. Also, because you can leave most digital meat thermometers in the meat while cooking it allows for continuous monitoring of the heat. Most units allow you to either use the preset meat temperature points (different ones for poultry, pork, rare beef, medium beef, etc.) or you can pre-program a specific temperature you are shooting for. The computer in the thermometer then continuously monitors the change in temperature and can even give a rough estimate of cooking time to get to your goal. It can also set off an audible alarm when your desired cooking temperature is reached, alerting you to take it off the heat. This avoids the constant and nerve-racking hovering over the grill that most of us have done, nervously wondering if it is done or getting overcooked. Besides, when we try to estimate doneness ourselves, we often lift the lid off the grill way too often, loosing precious heat and smoke. The digital meat thermometer allows you to relax and just wait, only occasionally checking in and tending your coals as needed (a grill thermometer is useful to keep track of the internal temperature of your closed grill, so that you can monitor and adjust the heat as necessary). Some digital meat thermometers are actually wireless, with a remote handset unit that displays and monitors your temperature at a distance. This can be useful if you want to hang out and relax somewhere far removed from your grill. While most people enjoy hanging out around the grill, you may be entertaining inside, cooking other food in the kitchen or otherwise distracted. You can keep these in your pocket so that you can always check the temperature and hear the alarm when it goes off. How do you use a digital thermometer? As with any meat thermometer, you should place the probe needle into the middle of the deepest, thickest part of meat which will take the longest to cook completely. It is usually easiest to just place the needle at the start of cooking and leave it in throughout the cooking process, particularly for large roasts like whole poultry. Note the needle probe inserted into the breast of the turkey pictured above before cooking. How you then hook up and program your thermometer varies from model to model. Follow the enclosed instructions. Set the temperature as called for in your recipe or use one of the preprogrammed temperatures for the type of meat you are cooking (beef, lamb, poultry, or pork) and the desired doneness (rare, medium-rare, medium, etc.). Special Note: When cooking larger roasts it is usually advisable to set the final temperature a few degrees below your optimal cooking temperature. The reason for this is that after you remove the roast from the grill or oven the internal temperature continues to rise a bit, as the thermal mass of the meat redistributes the heat. If you leave the needle in you'll see that the temperature in the middle goes up a bit as it rests. It is advisable to let meat rest for several minutes or more (more for larger roasts) after cooking for the heat and juices to redistribute and equilibrate. Here is a general guide for temperatures for doneness for various meats. With meats that can carry disease (like poultry and pork), err on the side of higher temperatures, especially if you have any doubt to the quality and freshness of the meat. Done with the Digital Meat Thermometer page?